Wow, time to celebrate! Jackie’s brother John came to visit and we cheered his new retirement together. 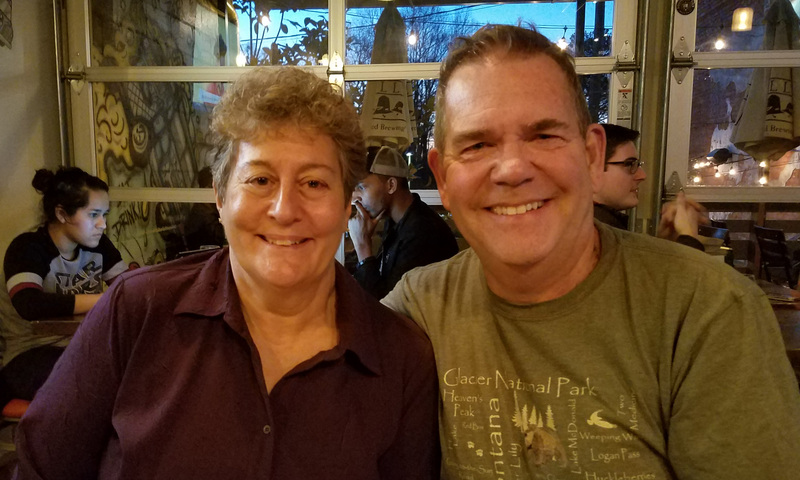 We figured it would be proper to go to our favorite local breweries and toast the event, followed by a barbecue at Kennesaw’s Pigs and Peaches. 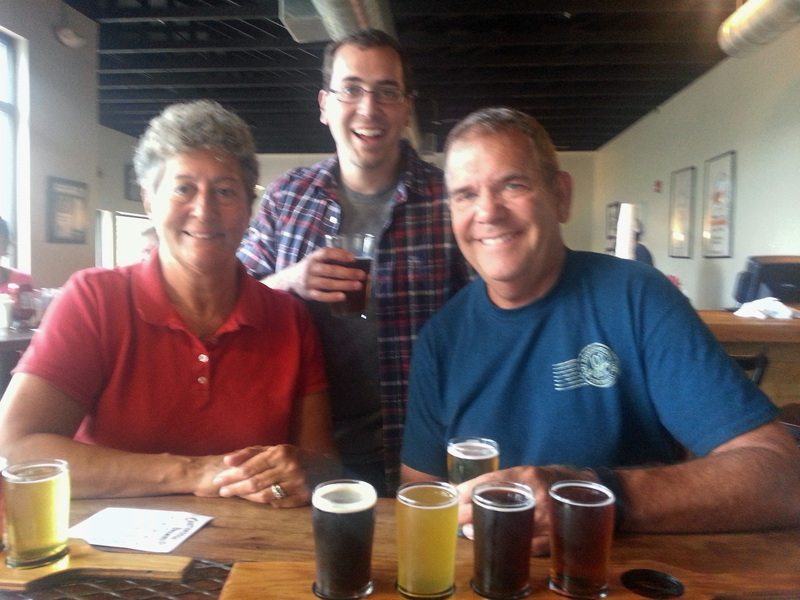 Dan and Terri joined us for flights at Dry County and we hit up Burnt Hickory later in the weekend. We also filled him in on proper retirement behavior: afternoon naps, relaxing with coffee and the paper in the morning – that sort of thing. We might have talked him into joining us on our next cruise, but that all depends on his home-building schedule (he is building a new cabin in the mountains). 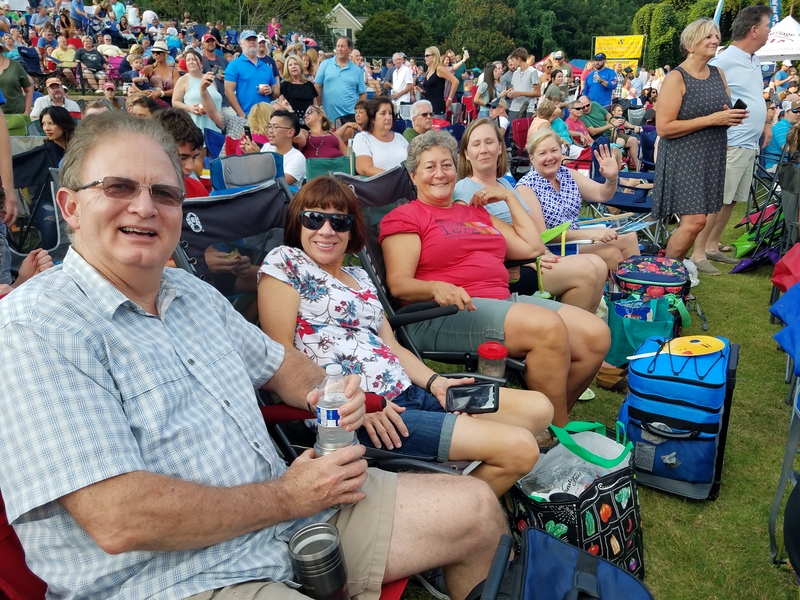 No, it isn’t the festival from the ’60’s, but it was a nice evening in July at the amphitheater in Woodstock, Georgia, listening to a Journey tribute band. Great evening, and great friends (our BrewCrew). 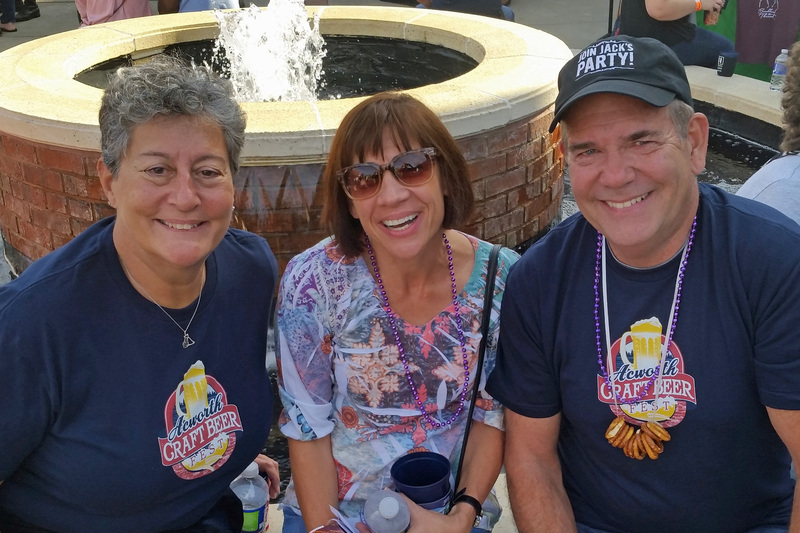 Jackie, Doug and Linda all set to enjoy! Our BrewCrew just couldn’t pass this one up, and it turned out to be the best day of the year so far. Beautiful weather and a huge crowd, with plenty of local and regional beer on tap. We all volunteered to pour first shift, although we didn’t get to stay together at the same taps. But it was fine and lots of fun. My sister was visiting from California and was able to volunteer at the front gate, so our crew grew by one temporarily. It’s been a weird winter and spring this year, with temperatures bouncing up and down: Warm in winter, darn cold in spring. Despite all that we managed to have some fun with our friends in the area. 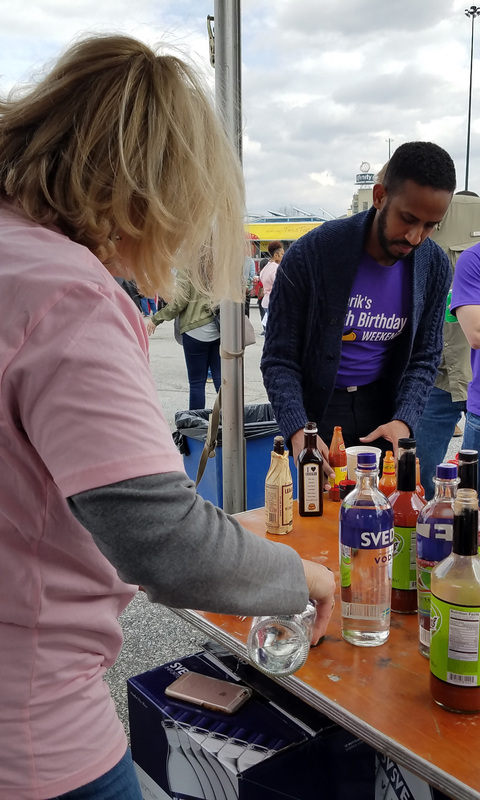 We volunteered to pour at this event for the first time, held in Atlantic Station, downtown Atlanta. It was a great day and perfect toast to the spring season (we hoped!) 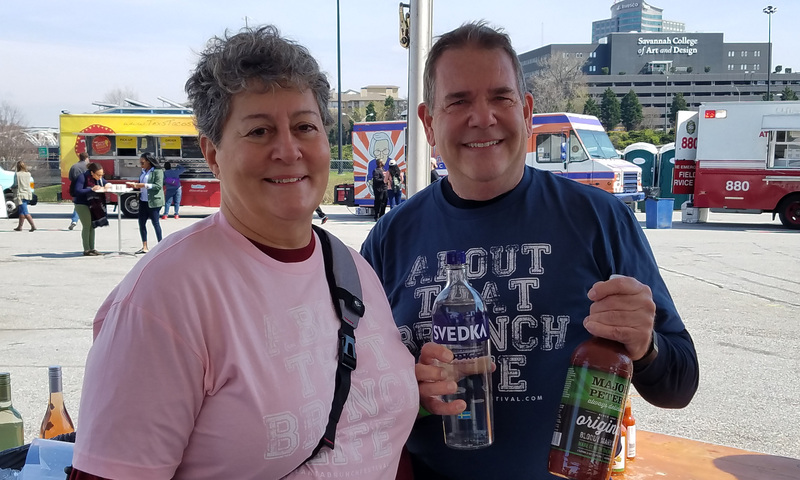 Barb and I worked a Bloody Mary booth while Jackie and Tara handled wristbands at the gate. Of course we got to wander about and have some mimosas and Bloody Marys ourselves when our shift was over, although the food trucks started to run out of munchies. Good fun. 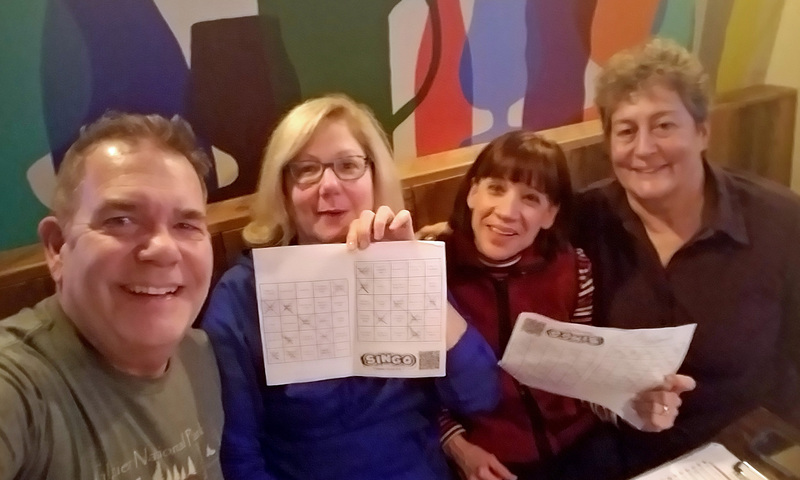 We tried a musical trivia night (Singo) at Truck ‘N Tap in Woodstock with Terri and Barb (they are masters at this!) Good beer, crazy fun. 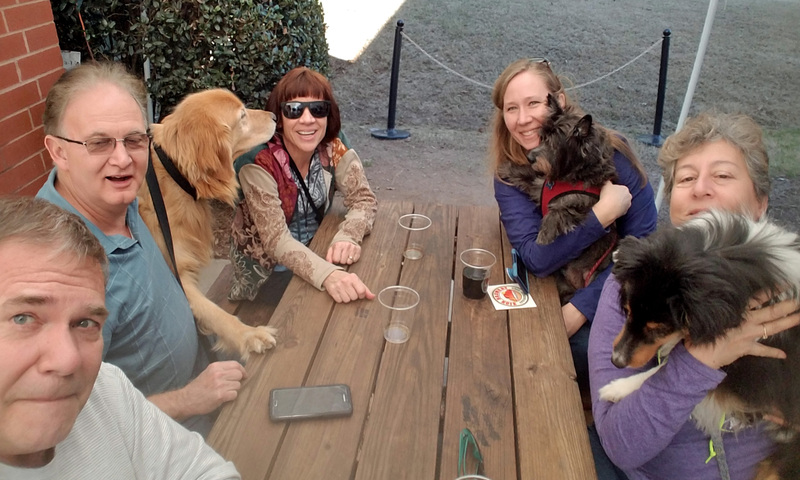 Had to take the dogs to socialize at Burnt Hickory Brewery in Kennesaw. They brew some crazy beer – we all liked a few of the stouts and porters. 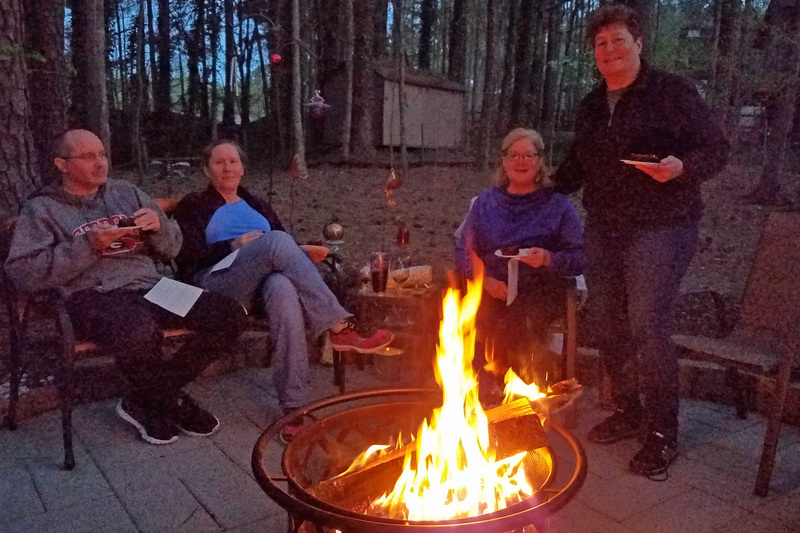 S’mores and beer around the firepit on a particularly nippy night went over so well we repeated it a week later. Again, the dogs got together with us as we watched deer in the yard, listened to owls, sampled beer and had a few yummy s’mores. 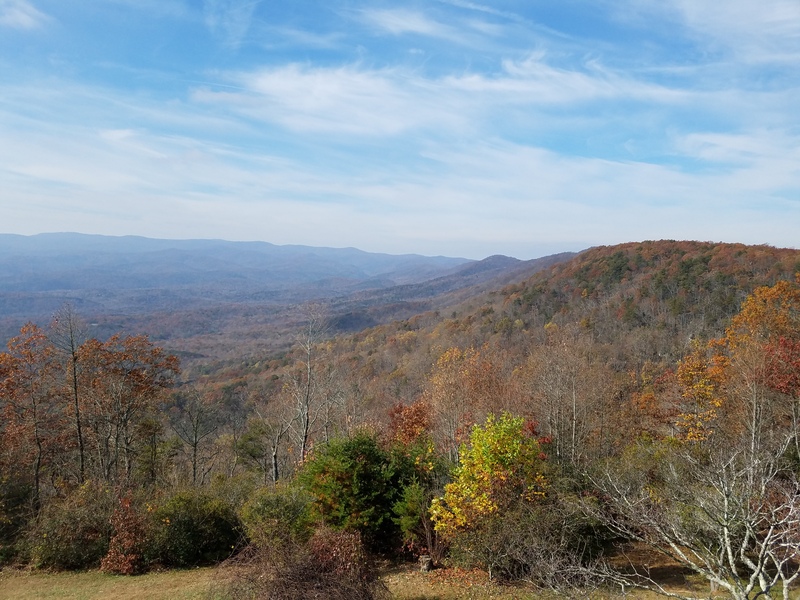 Now that fall weather is officially here, we headed to the Georgia mountains to check out the fall colors and try the Screaming Eagle Aerial Adventures at Amicalola Falls State Park. Wow what a perfect day! 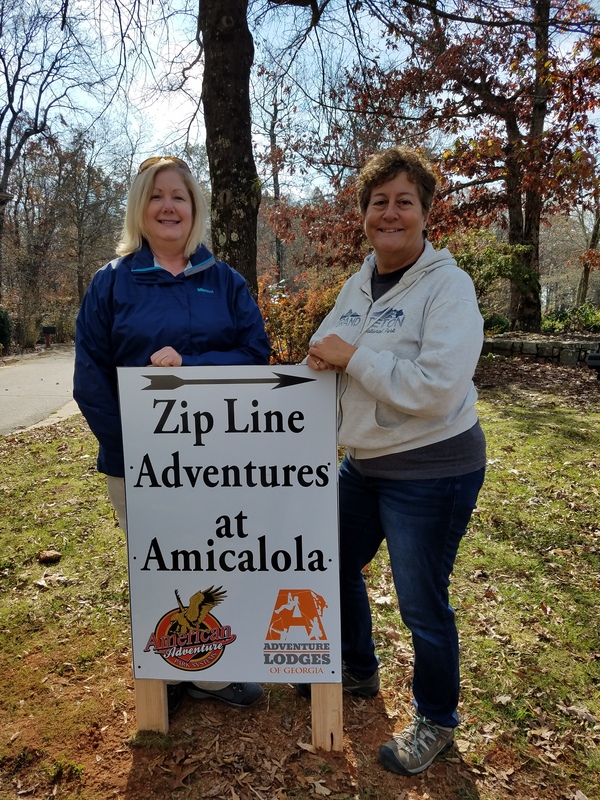 It was really Barb’s suggestion and we jumped at the chance to try it (since we had already done the Unicoi State Park zipline). 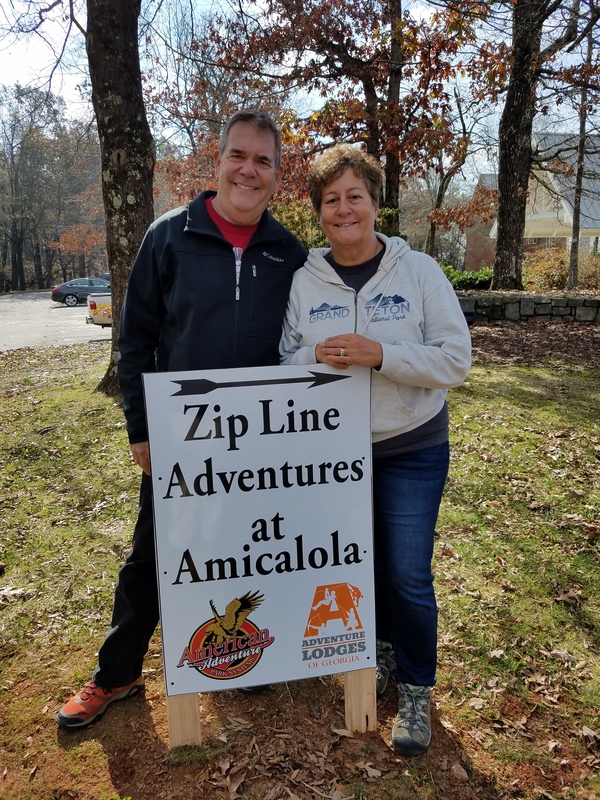 The three of us hopped in the car and drove to Amicalola on a brisk November morning to run the Tier 2 zip adventure (which could last up to 4 hours, but we made it through in 2 1/2). It’s gonna be fun, right? There were six suspension bridges and 16 ziplines, along with some short hikes to connect. 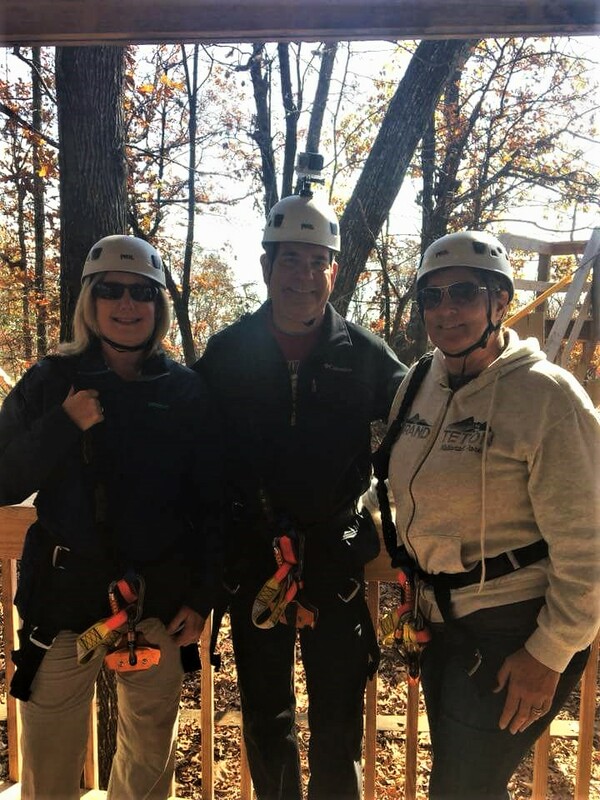 The highlight had to be a 1,000 foot run (that we did twice) and the final 2,000 foot zip 350 feet in the air — with a great view of the mountains and valley below. What an amazing and exciting adventure. It was just the three of us with our three guides, so it was a very personal excursion. 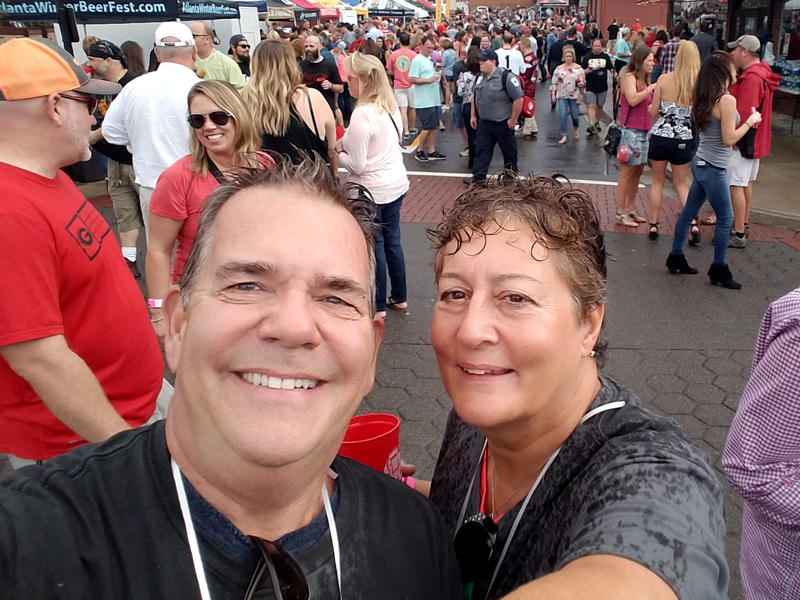 Raining and Pouring at the Beer Fest! Sampling fun with our peeps! 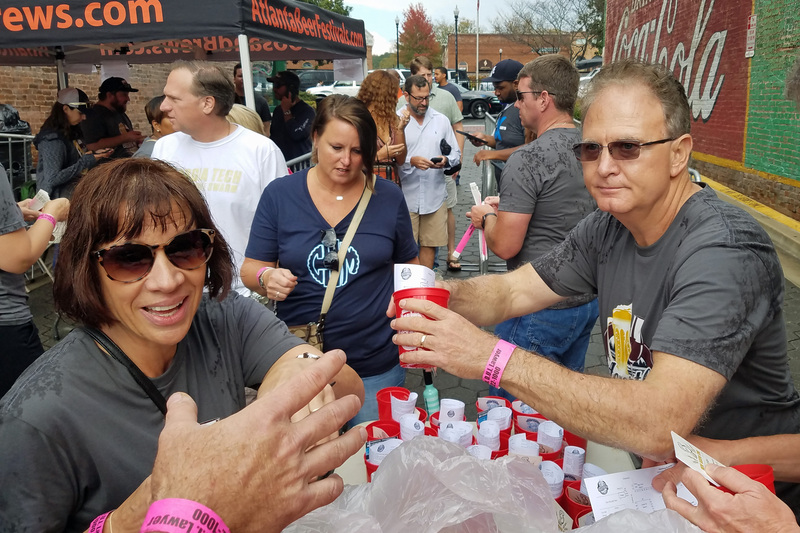 Our best buds here in town joined us in volunteering to pour beer at the Acworth Beer and Wine Fest this fall – “c’mon, it will be fun. Let’s all pour at the same tent!” We each scrambled online to get the shifts we wanted, but it must have been a high-demand event and we all got different assignments. 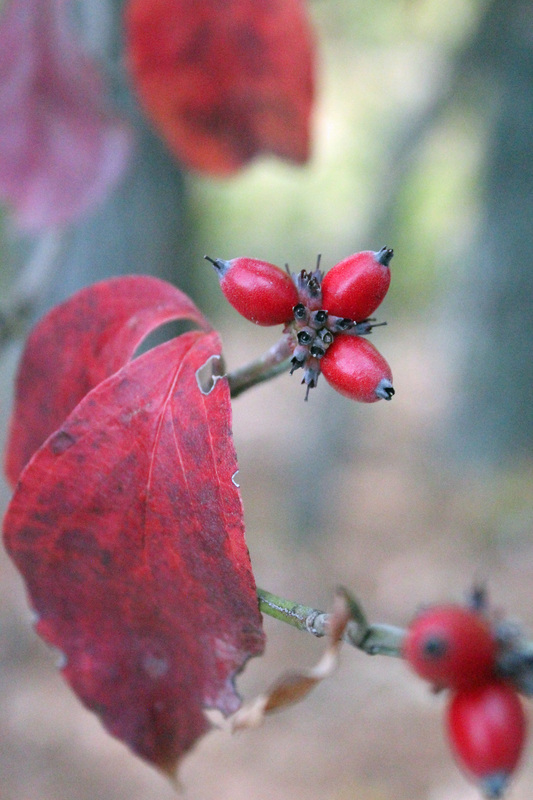 No matter, it was going to be a great fall day, right? Well, Mother Nature had a few tricks to play — maybe a half hour into the event we had a total downpour! It was easy to get soaked . 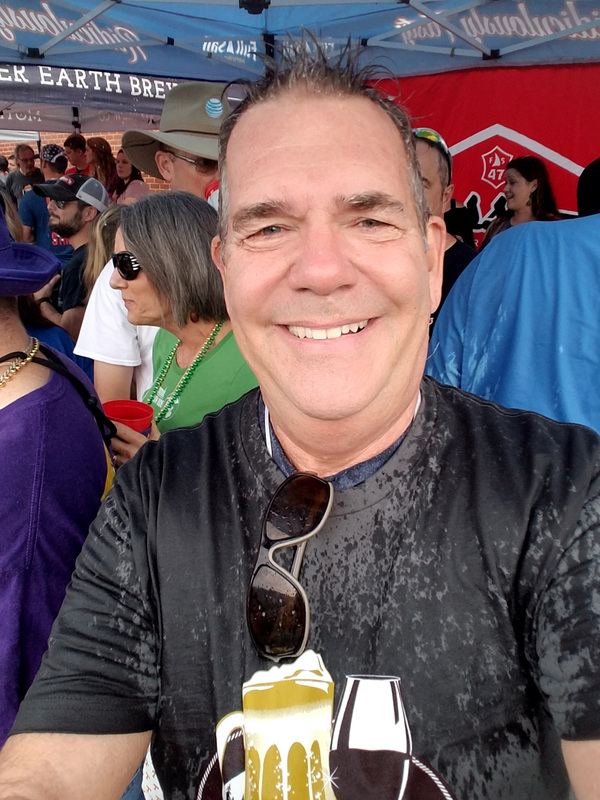 . .
For maybe 20 minutes or so everyone huddled under the beer tents and continued to sample the beer — and then the sun came out and all was well with the world. We really did have a fun afternoon, despite the rain (which actually helped by knocking down the numerous, pesky yellow jackets flying around). the beer awaits! Dan and Terri did their best . . .
Now that we are back home for a bit (from our western adventure), we caught up with some of our local peeps and of course had to resume the craft beer sampling. 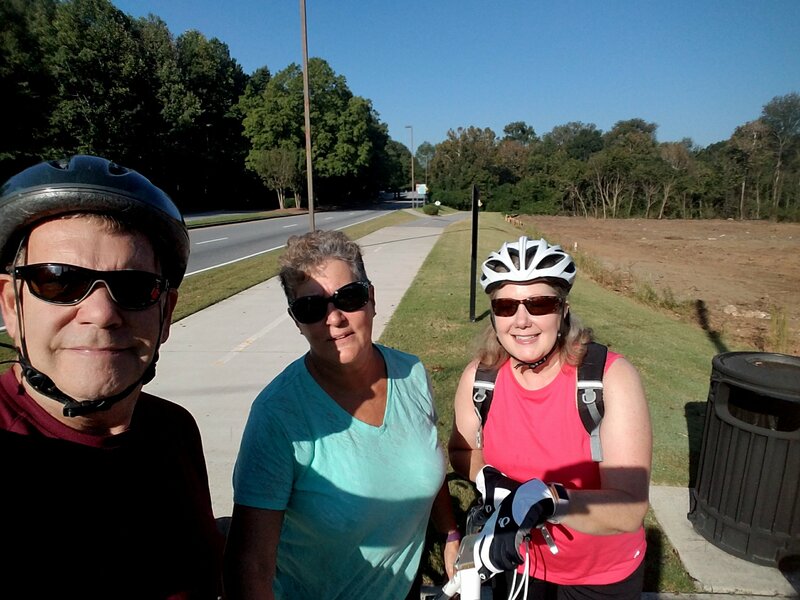 Jackie, Barb and Doug rode the Noonday Creek Trail to get some exercise on a reasonably cool morning, and then headed over to Roswell to try Gate City Brewing. 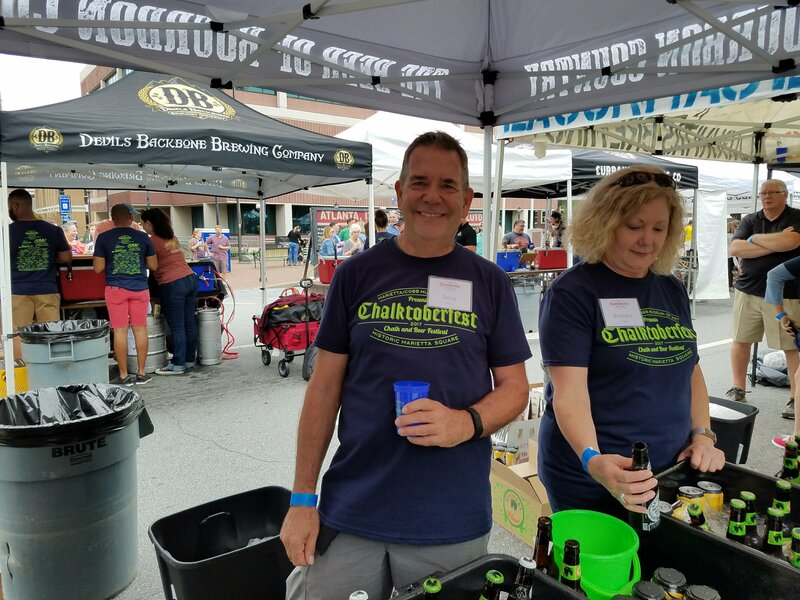 It was the first time we saw how the new Georgia craft beer law was working (September 1st change) and it worked for us. Bought a few short beers from a pretty good selection on tap. 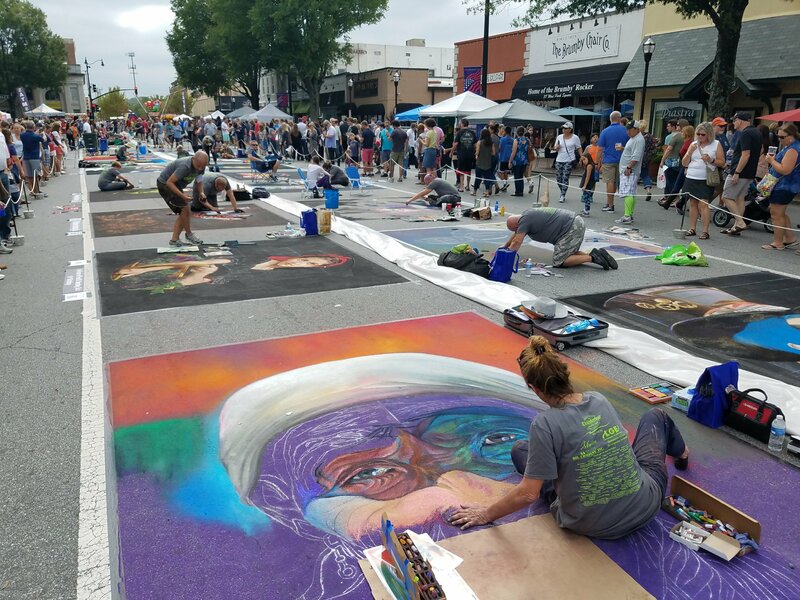 October brought the Marietta Art Museum’s Chalktoberfest on the square, where we volunteered with Tara and Barb to pour beer. 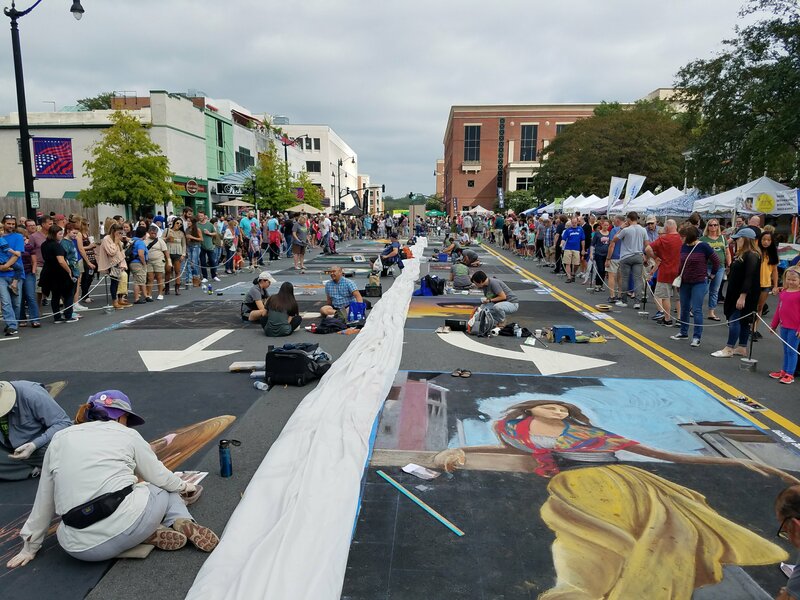 About 40 breweries represented along with food trucks, music and the chalk artists. Fun day out, plus after our shift we did our share of sampling. 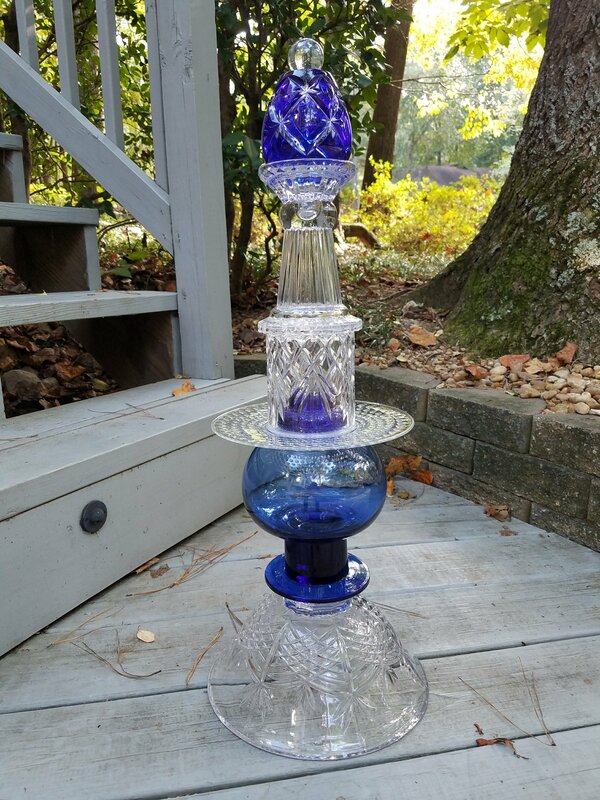 And now that we are back home, Doug has resumed his new hobby of glass totems. 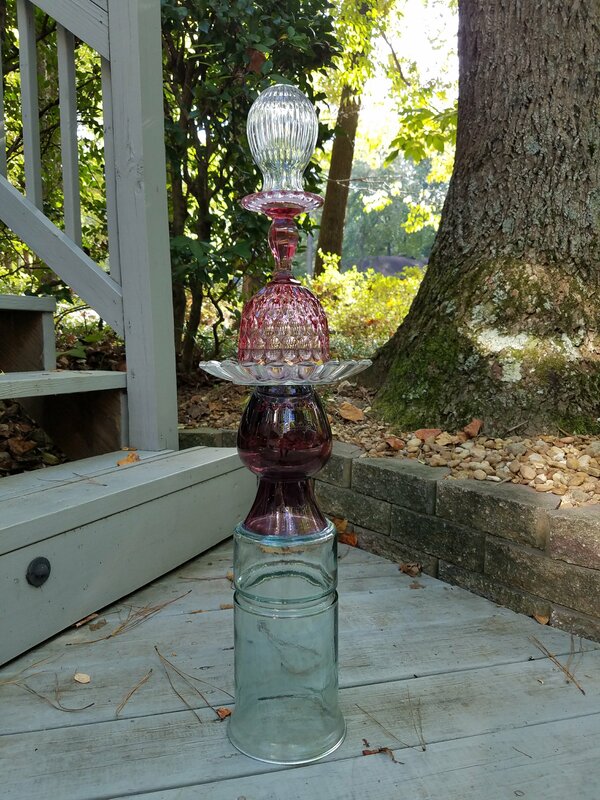 Some of the latest creations are headed to the backyards of family members (until they tire of the folk art). 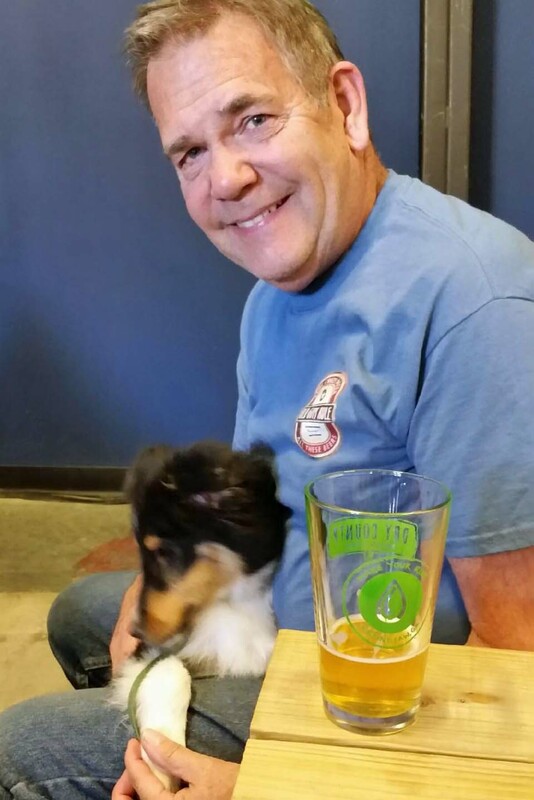 Well, it keeps Doug busy between beer-pouring events! 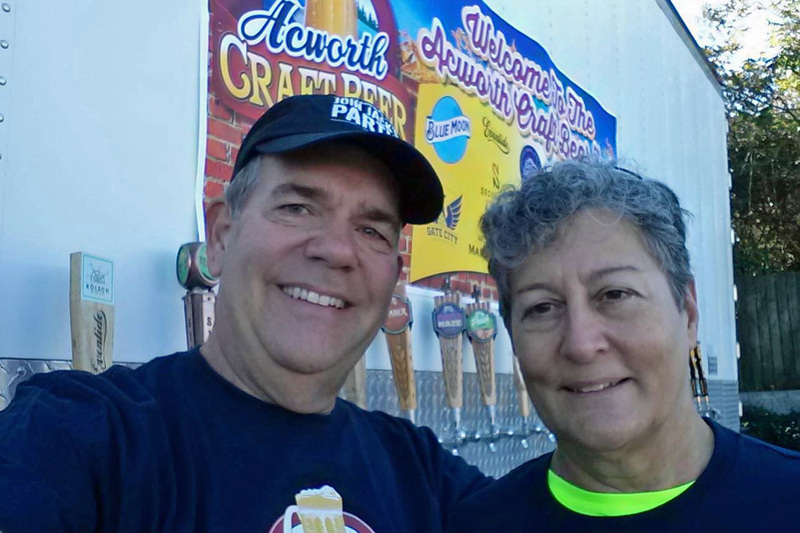 Yes — the next event is the Acworth Beer Fest in November where we are set to be volunteer beer pourers yet again. Gosh, retirement is rough! 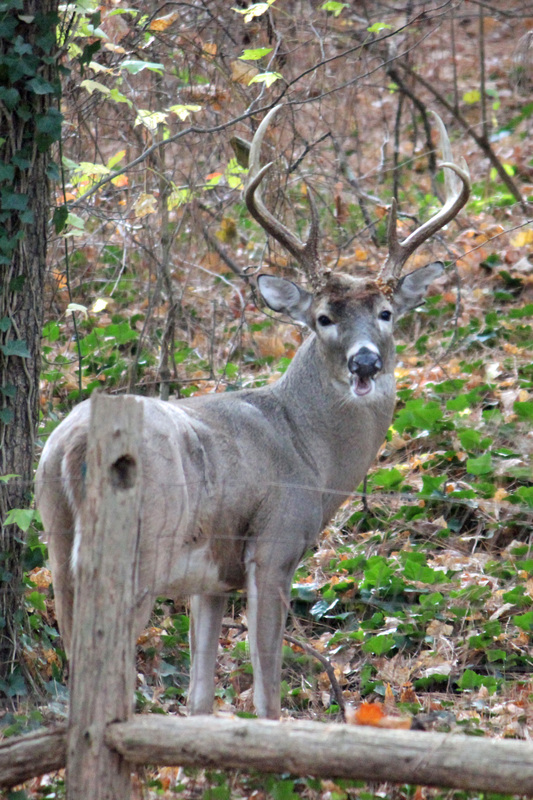 It seems our local herd of deer is ever more comfortable around the yard – they hardly flinch when we try to shush them away. 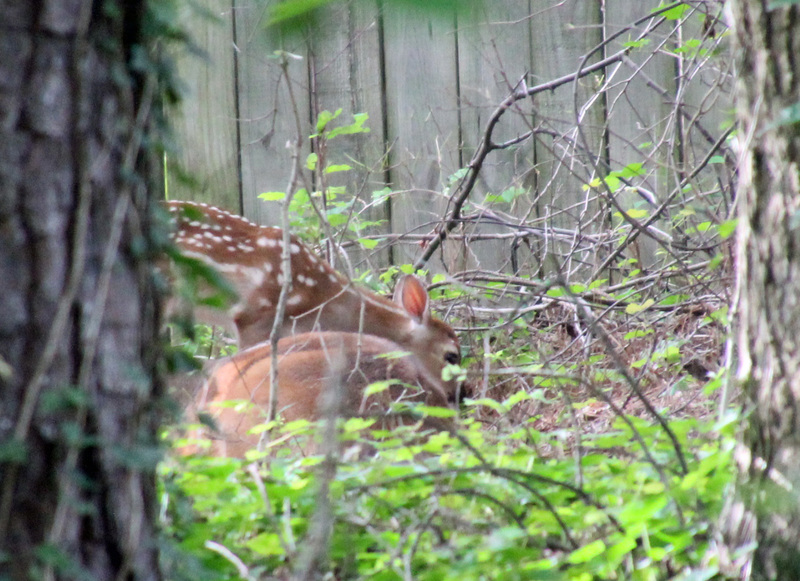 We have been keeping a careful eye on their comings-and-goings and now believe that we have two does each with a pair of fawns, one doe with a single fawn and a buck who is making himself part of one family. That would be 9 in the herd. It was cleaning day recently, so I went ahead and snapped a few shots. We have such a great time with our group of friends and sampling the brews at some of the local breweries. 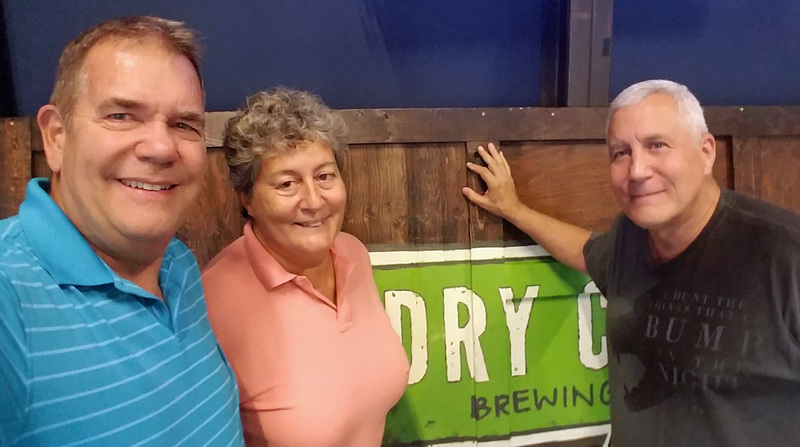 We listened to Blind Fate (Dan and Terri) playing one weekend at Dry County Brewing. They just keep getting better with their classic rock. Kodi came along and was just fine as our brewdog companion. Had to keep his nose out of the beer, though. 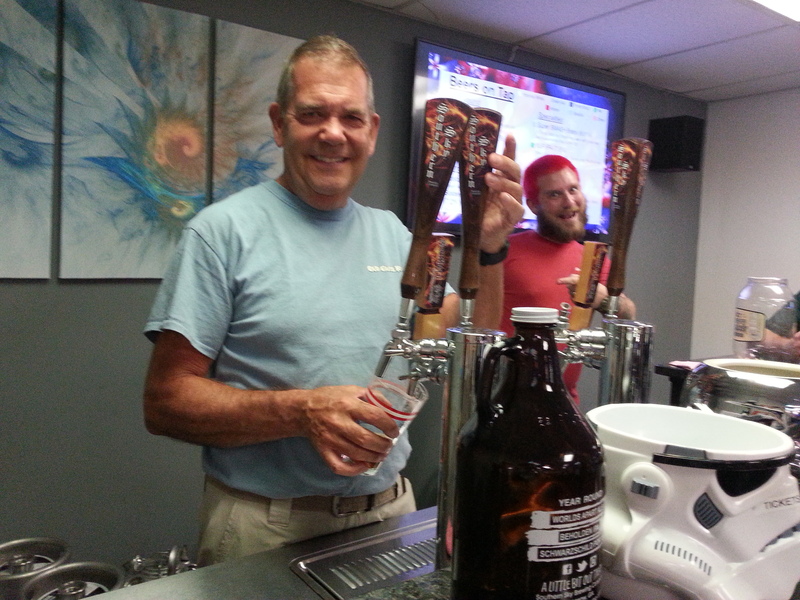 A new discovery is Naughty Soda / Ironmonger Brewing in Marietta. Like most of these local breweries it is not that big, but their selection of beer plus hard and soft sodas was surprisingly varied. Good choice for a visit. Did anyone try the sodas? 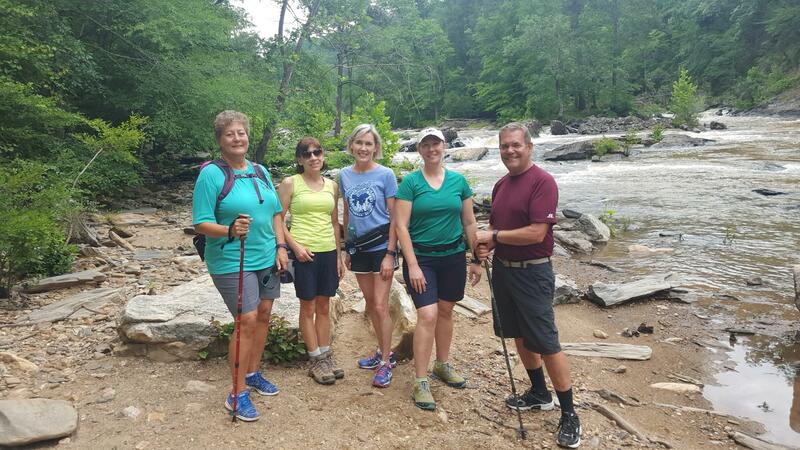 Thanks to the thoughtful planning of Tara, several of our gang (Tara, Starr, Terri, Jackie, Andrea and I) met up to hike the trail at Sweetwater Creek State Park. 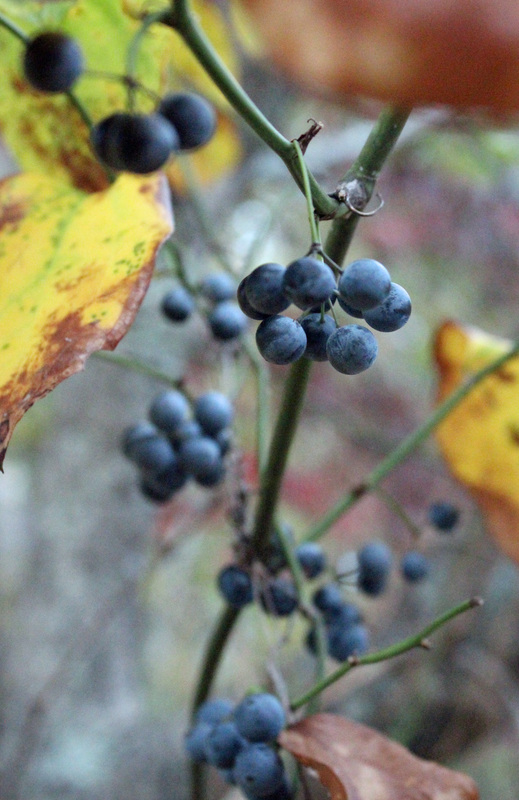 It turned out to be a great day, as we had mild temperatures and overcast skies, making for good hiking conditions. 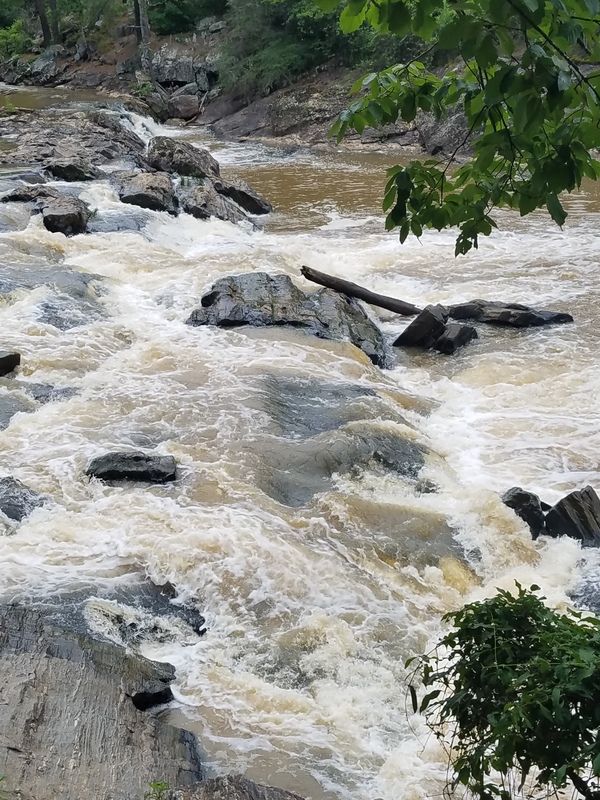 As you can see, the water was roaring along, due to the routine thunderstorms we have had recently. The park has been the set for several TV and movie productions we understand (Mockingjay?) and there was some activity around the ruins of the New Manchester mill works. Along the 6 mile hike we saw a good variety of wildflowers, including lousewort, water hemlock, spiderwort, cranefly orchid (?) 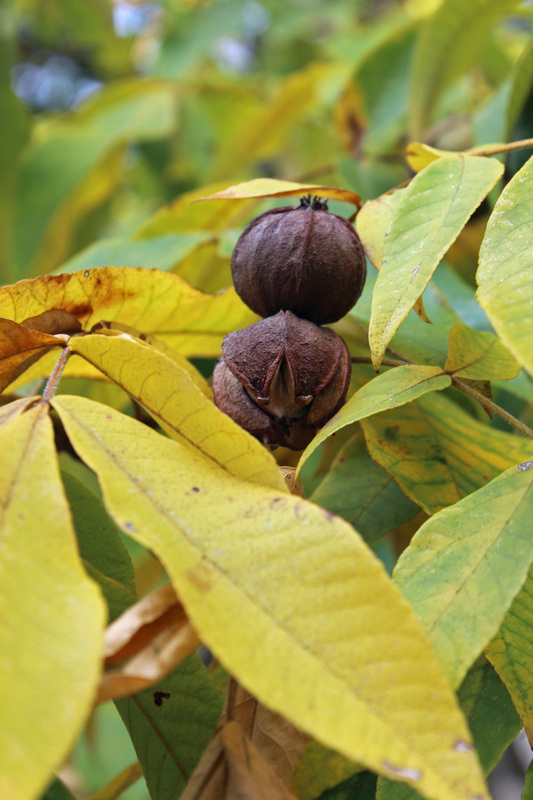 and the flowers of the hophornbeam tree (if you are a craft beer enthusiast, you will note the resemblance to hops). 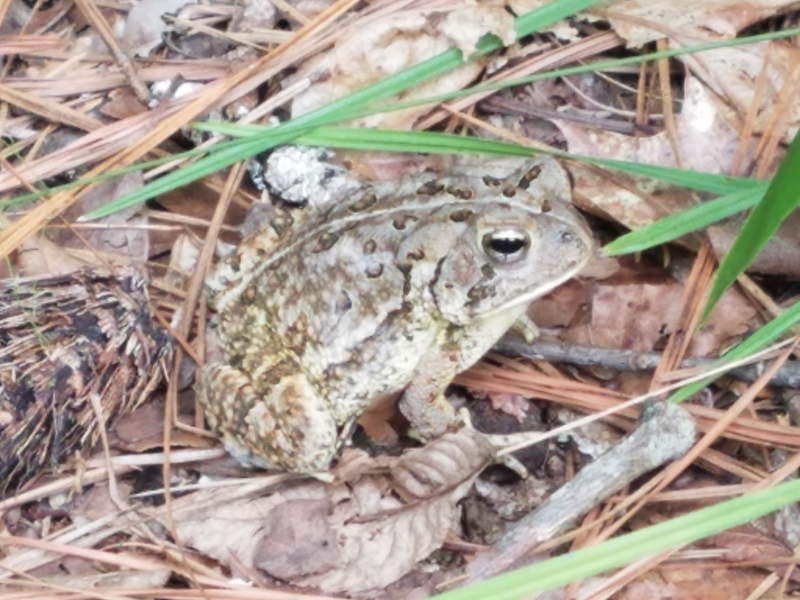 There were even a few critters along the riverbank (frogs and fence lizards). Of course we were totally drained from the trek, so we had to refresh ourselves at the local World of Beer afterward. Made for a great day! Once again we are deer-parents. Days before our Retirement+2 party and our trip to Panama City Beach, we were eyeing the 4 deer who had been regulars in our backyard and the neighbors to the left and right. This small herd seems to be the original doe and three of her daughters. Two seemed to be pretty pregnant, so we were thinking any day now. After being gone for just over 2 weeks, it seems we missed the special day, but clearly we have yet another fawn that was born. This time the pair was spotted early in the morning by Kodi, who was barking at the doe along the fence line who didn’t move and really didn’t leave … a sure sign that she was keeping watch over her baby. And moments later we spotted the youngster hopping out of the ivy next door for a morning feeding. We are back home for three days and already we have had an incident. Kodi and Doug stepped out back for the early morning (6:30, ugh!) call of nature only to have Kodi spot the doe in the yard and take off after her. While Doug yelled for Kodi to stop, he chased the deer around until the doe turned on him and they tangled up, with Kodi yelping. All we could think of was a repeat of the injuries Benji suffered a few years back that left him with a pretty bad hole in his side after being kicked and flipped by that doe. So far, Kodi seems unharmed physically, but he is a bit subdued for now. The doe stuck around the yard for a while, even as we walked around chasing her off. Hope the fawn gets up and around pretty quick and they head off for another spot. It appears this morning, thanks to some barking from Kodi, that we had twins again this year. 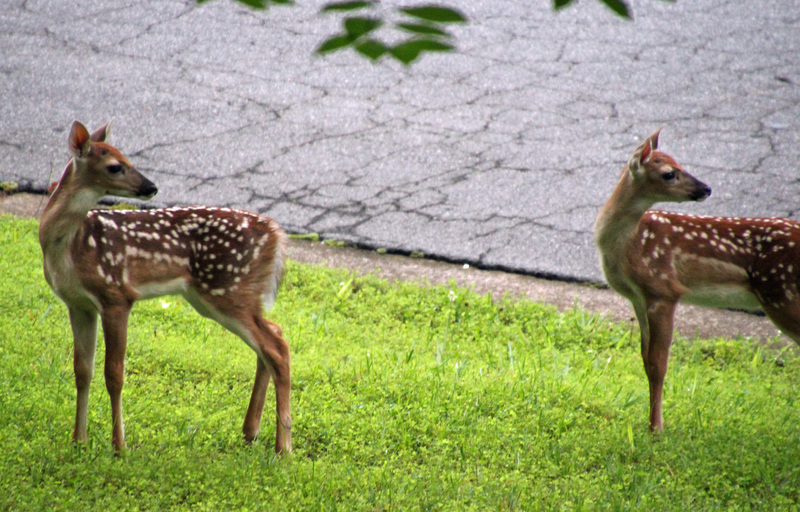 They were romping in the front yard until mom came across our backyard and hustled them up the street a few more yards. They look older than 2 weeks, so maybe they were around earlier than we thought. We had a blast this weekend, celebrating new retirees Karen, Bernadette, Aria and Teacher of the Year Tara. 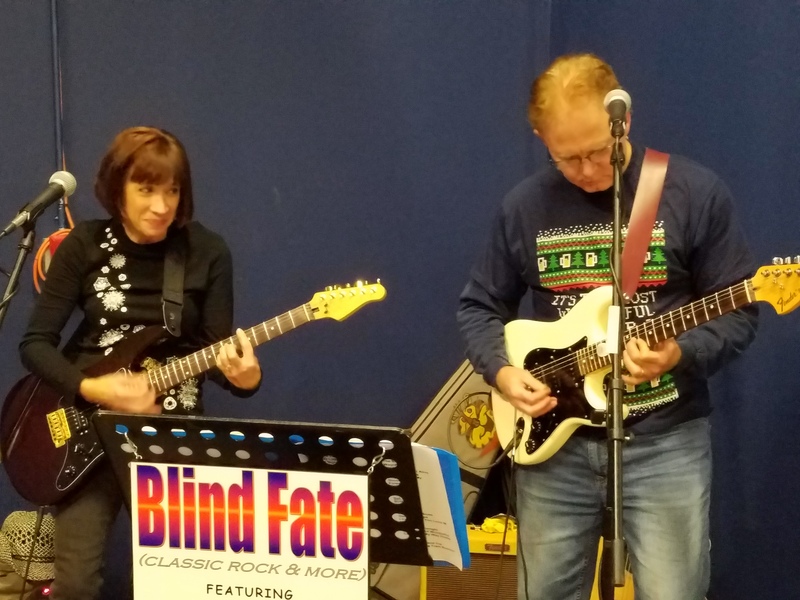 Great music by Blind Fate (Dan and Terri with featured artist Barb), awesome craft beer to share, good stuff from the grill and bountiful, delicious salads prepared by all our teacher peeps. It was a great way to break in the new patio. What fun and what a great group of folks to know. Everyone needs to keep in touch. The new patio got broken in just fine. Spring is here and summer is not far away, so it is time for some outdoor fun. Who is behind those glasses??? 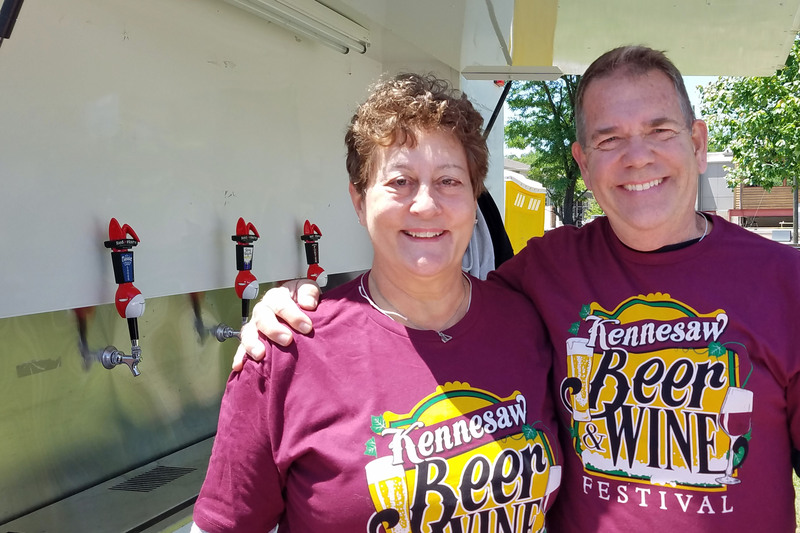 We volunteered at the Kennesaw Beer and Wine Fest, dispensing brews from the Red Hare taps and then sampling all sorts of local and regional craft beer. It was a beautiful sunny day for this, just a bit breezy but loads of fun for an afternoon. 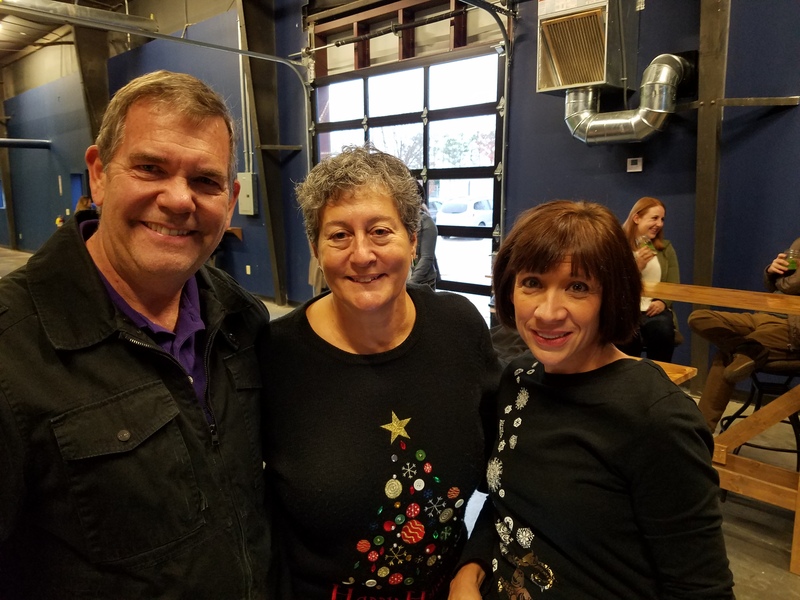 Our good friends Tara, Barb and Terri (beer peeps) were there as we tried sours, pale ales, porters, stouts, pilsners, saisons, mimosas and even some local bourbons. Oh, and we just HAD to have our pretzel necklaces. Good times with good friends. A Little Roof Cleaning . . .
From black ick to clean white, with some effort. 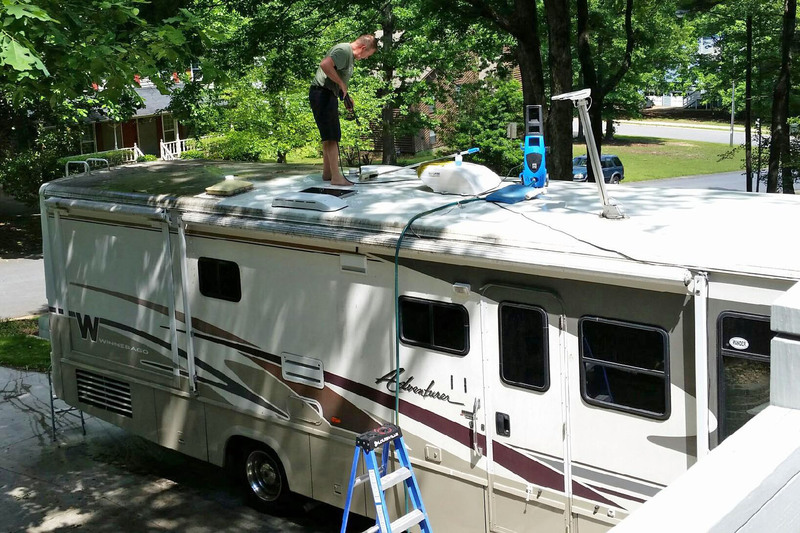 Since we are soon to hit the road to Florida and other campground destinations, it was time to have a look at the RV again. My, my, that roof does get nasty in the Spring! So a day of power washing and scrubbing finally revealed the white roof beneath. It was a pretty tiring day, but gosh, doesn’t it look so much better? Well, one more day to apply some UV protectant and we will be ready to pack up for St. Andrews State Park. Kodi has been learning some behavior basics at puppy class so we decided a few class trips were in order. 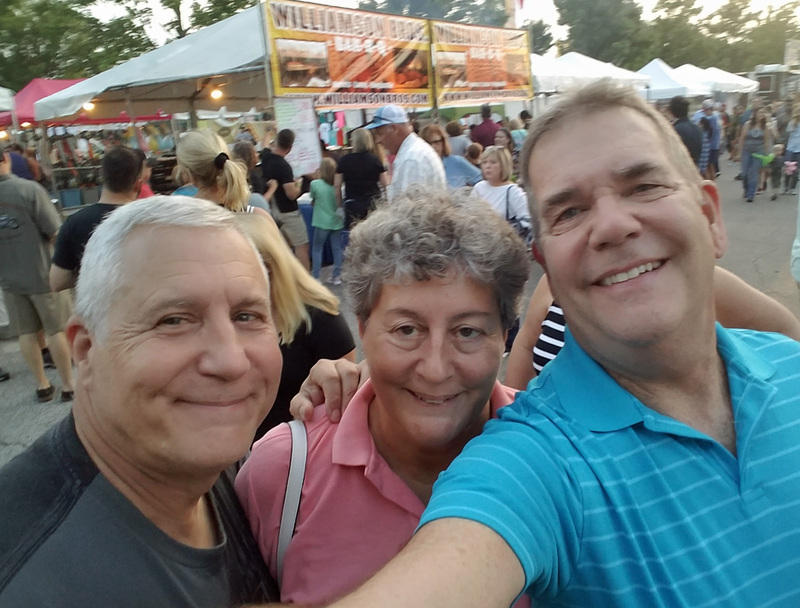 For two weekends we checked out some of our local breweries… coincidentally where friends Dan, Terri and Barb (Blind Fate) were playing. 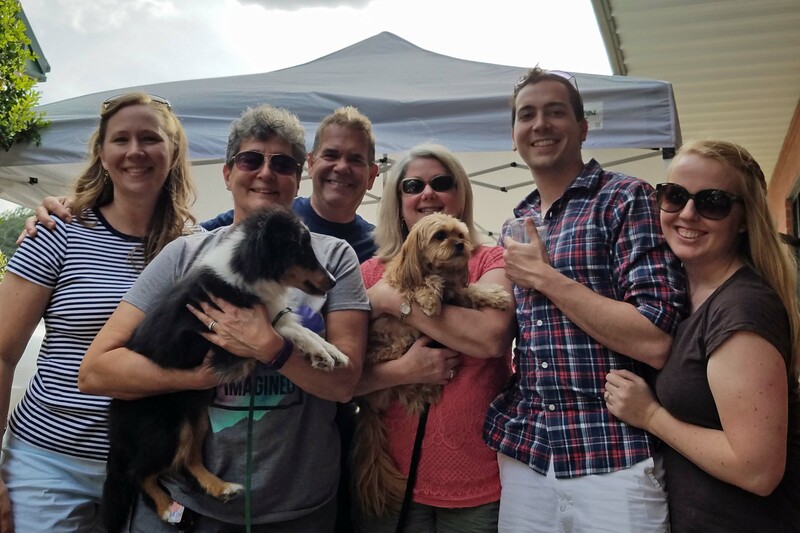 Kodi loved the people he met, the music and a few other dogs. What fun. 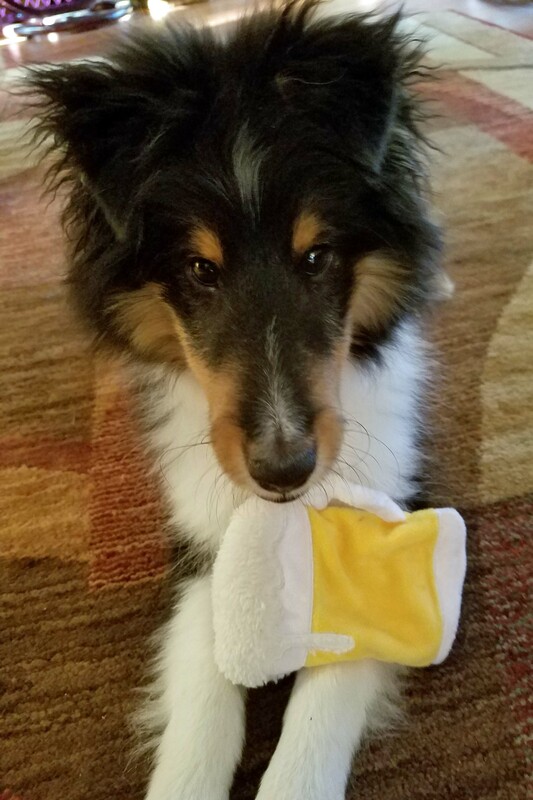 He even got a special beer toy just for him! We figure it is good practice for the anticipated beer samplings we will encounter on our summer and fall trips around the country. Barb C. was playing with the Cobb New Horizons Symphonic Band last weekend, so we went to listen to some stirring holiday music and recognized a few retired school band directors among the players. Well done and a great start to the holiday season! Then off to Dry County Brewing to listen to Dan and Terri (Blind Fate) strum some songs and we sipped some beer. Getting into the holiday spirit at a local brewery. Just one of the many local appearances by Dan and Terri. 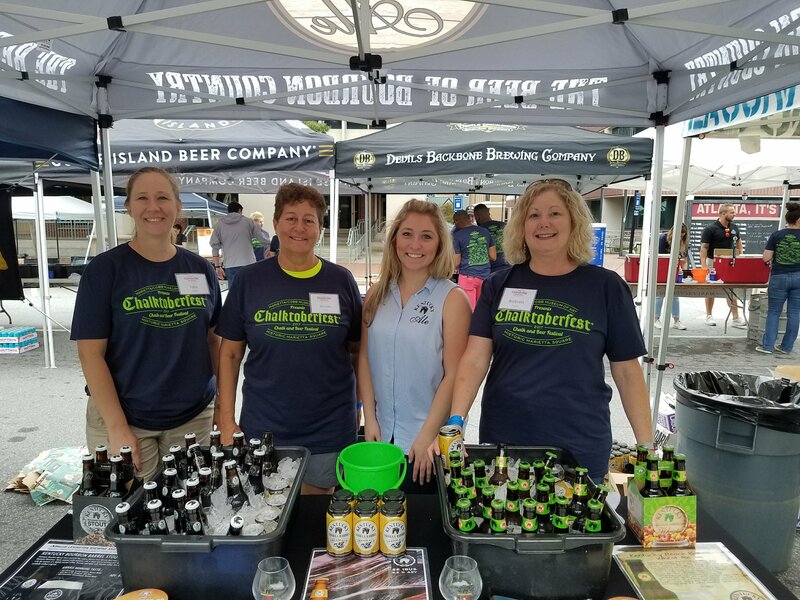 Yeah, I know, it’s getting to be old news with our craft beer samplings … but you understand if you have been out and about doing the same. Beer never tasted so good – and there are lots of fall and winter brews out there now with some great flavors. Speaking of which, Southern Sky Brewing, where I volunteer most Thursday nights, is about to brew up a few new flavors (they mentioned a Mesquite Honey Brown might be next). They have their four standards now in cans around town, so look for them and support your local small business / brewery! What to do with your empty Omaha Steaks Styrofoam coolers? 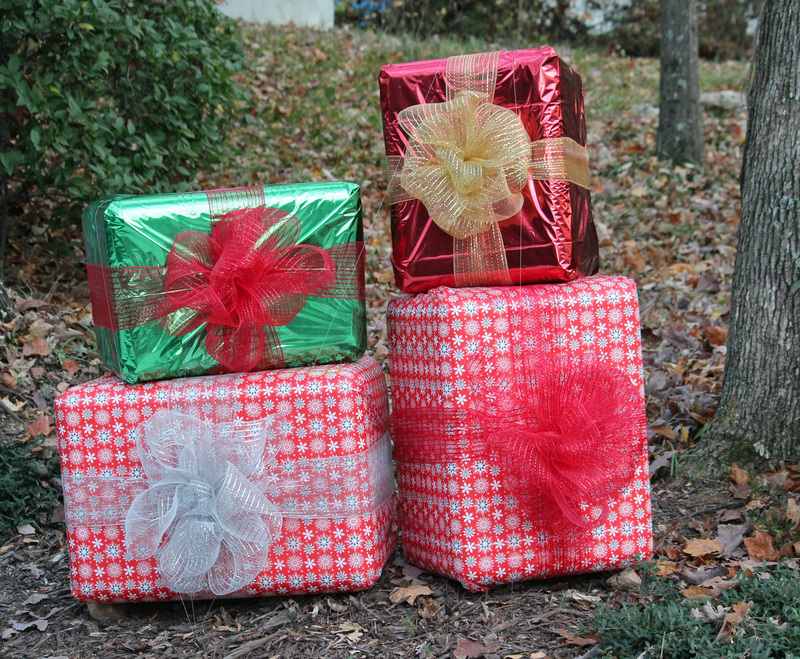 How about a display of big Christmas presents outside? 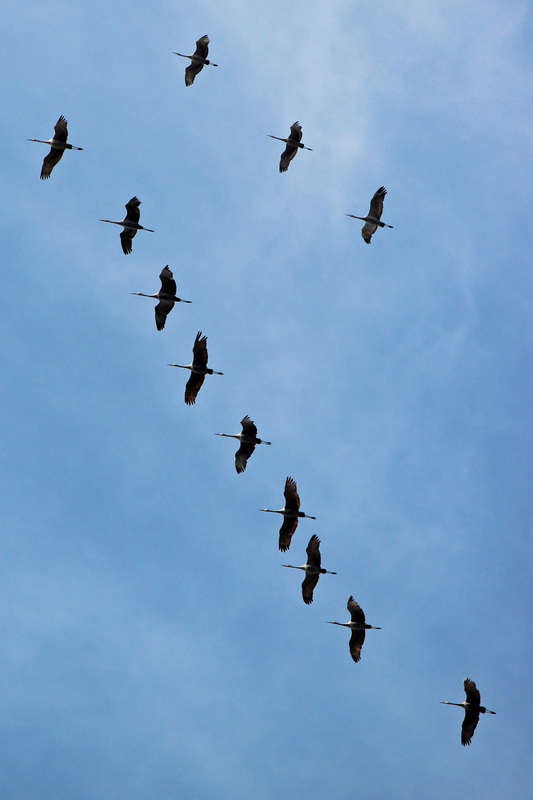 We were busy the weekend after Thanksgiving putting out the decorations for Christmas, raking up endless piles of leaves and getting the cover pulled over the RV when I heard the trumpeting of the sandhill cranes overhead. I dashed inside to get the camera, switch out the long lens and snapped a few shots as they flew overhead. 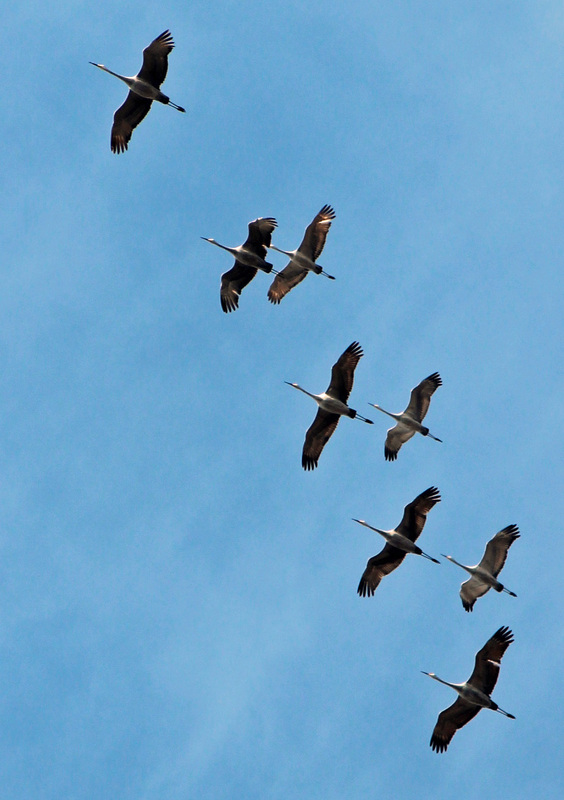 We are in the flyway for these very cool birds as they migrate to warmer spots south. To me they are more special than the Canadian geese flights, as bugle to each other and try to arrange and rearrange their flight lines. I always look forward to their flights in the fall. 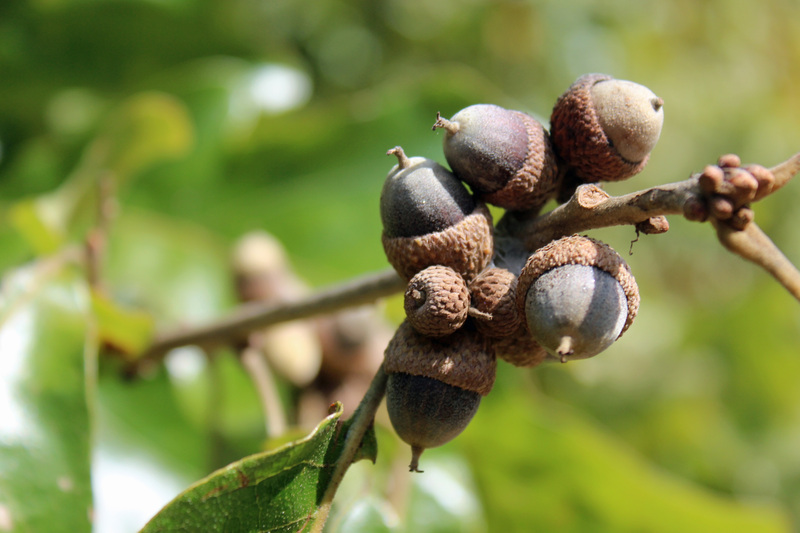 It certainly has been a big year for the mast crop (acorns, nuts and fruits from the trees). That keeps bringing the deer back to the yards that surround us. 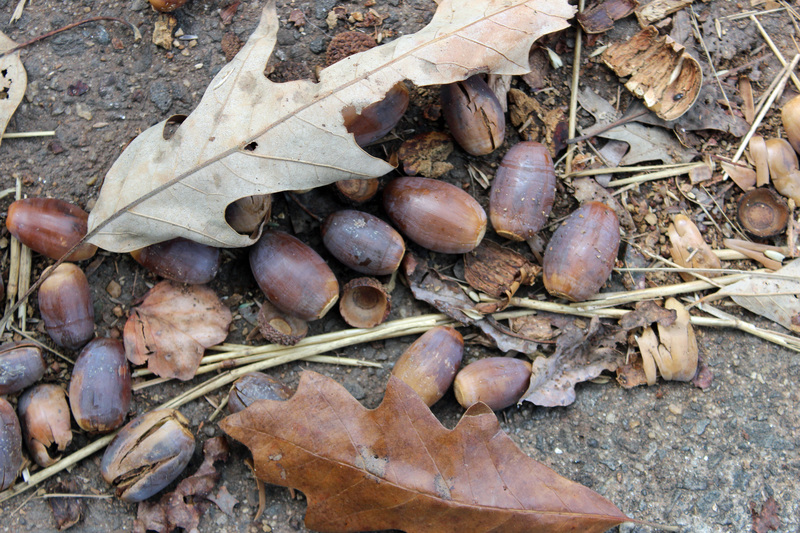 Plus, it keeps the squirrels and chipmunks pretty busy. I figure there will be an uptick in owls and hawks next spring! Just another day at a beer festival. 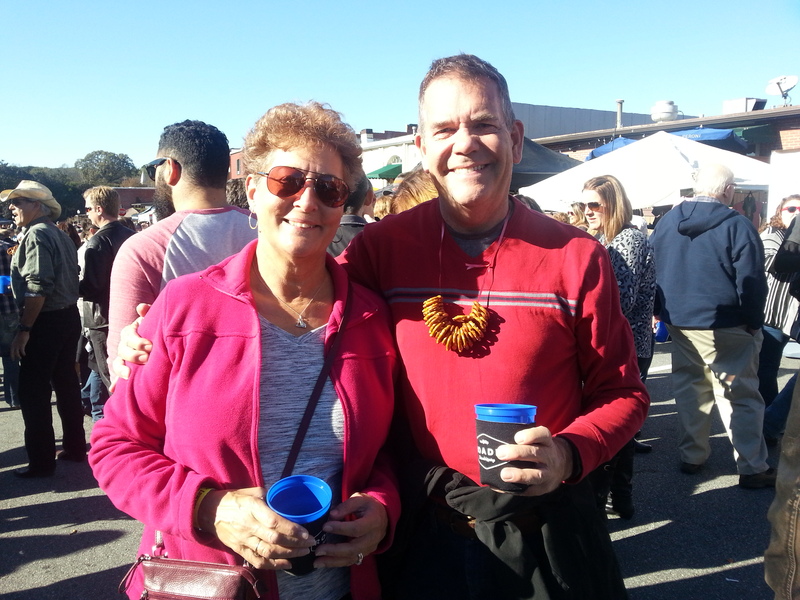 The first weekend in November and it was a perfect fall day as we spent our afternoon volunteering at the Acworth Craft Beer Fest. It is so much more fun now that we know something about the styles of beer and many of the local and regional breweries. 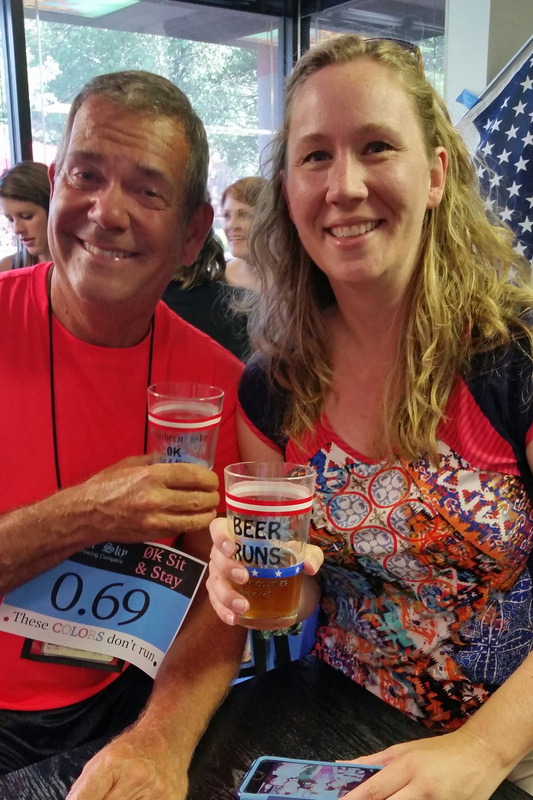 Our assignment was to man the taps at the Crispin truck… and we had a lot of beers and ciders that folks could choose from! Thank goodness we had a few other folks at our station helping out. That’s a lot of taps, Jackie. Think you can handle it? On tap were selections from Orpheus, Eventide, Gate City, Treehorn, Second Self, Southbound, Blue Moon, Sierra Nevada, Abita, Crispin … gosh I forget all the selections. Having a laugh with beer peep Terri. After our shift we got to check out the many other breweries represented and had a great time sampling. 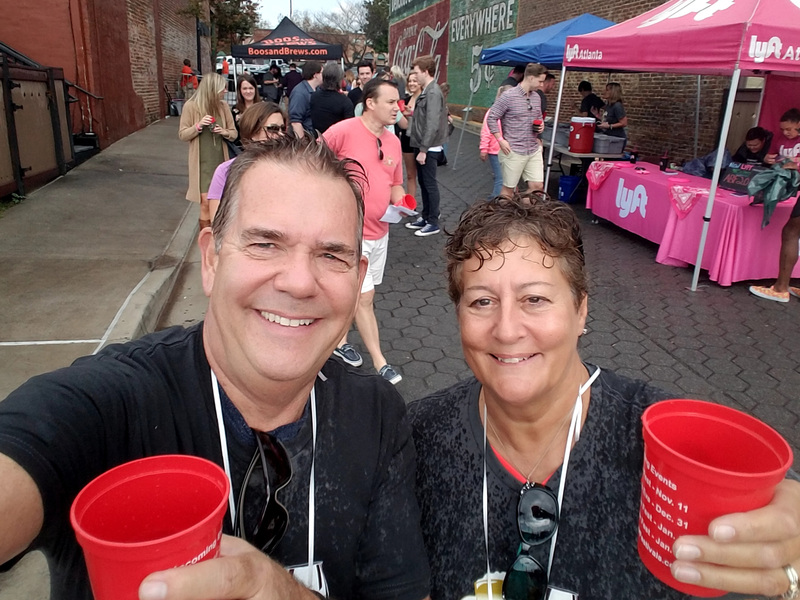 Our brew peeps were there, Dan and Terri (who play as Blind Fate), and we talked about their upcoming appearances at Dry County, Red Hare and the Marietta Wine Market. What fun. Craft Brews are now a Family Adventure! Back from our travels in the Florida Keys we were just in time for the “Friends and Family” can launch party for the Southern Sky Brewing Son of Icarus. This kettle-soured Berliner Weisse beer will soon be available in some spots around town, but you can definitely get it in the tasting room as part of your tour package. We were fortunate to be invited to their first can launch party for World’s Apart Ale, a pink ale (hence the can color). Both are great brews –you should stop by and try them (I volunteer in the tasting room most Thursdays). Southern Sky’s World’s Apart Ale and Son of Icarus now in cans! World’s Apart Ale, nice and cold! Spent a weekend with my folks this July and my brother and I took Dad out to a great spot to have a flight and good eats. 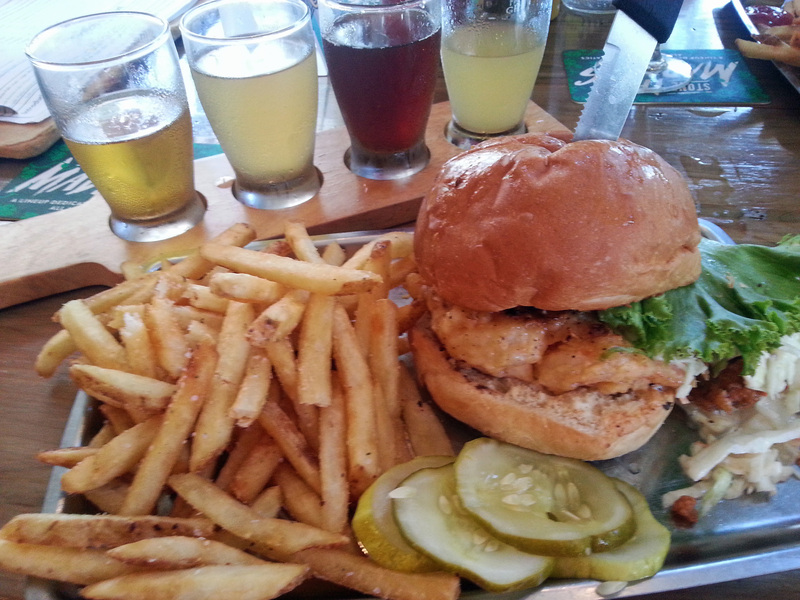 Fat Patties is a food and brew spot featuring Salt Marsh Brewery in Bluffton, SC. Dad had his first-ever beer flight with us and finished off a delicious pattie: Tide’s Changin, a shrimp burger topped with fried oysters. Beer-wise I particularly liked the Hive-A-Weizen and my brother Jeff loved their Daufauskie Rum barrel-aged ale. Although Dad was sipping the beer flight generously all meal, he liked the porter that was a collaboration with the Corner Perk coffeehouse. Tide’s Changin — great local shrimp pattie topped with fried oysters made for a great pairing with a flight of Salt Marsh brews. 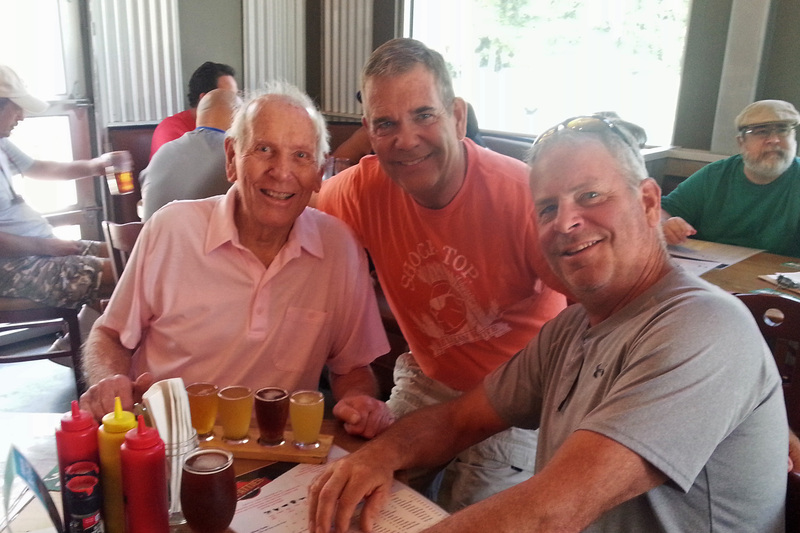 Just doesn’t get better than this – Dad and his boys having a beer together! Went to Chattanooga, TN recently to celebrate son Alex’s Birthday. We had flatbreads and BLT’s at Chattanooga Brewing Company with him and his great girlfriend Bethany. Jackie likes Chickbock Maibock and the Black Lager, Alex and Bethany like Chestnut Street Brown Ale and I enjoyed their Chattahooligan Lager (brewed for their local CFC soccer team). A flight with the birthday boy at Chattanooga Brewing Company. Now pouring at the tasting room! Retirement is cool. You get to pick and choose what you want to do, rather than what you have to do. So, volunteering to help out in the tasting room is what we want to do, from time to time. Thursday nights are a good start for us (5:00pm to 8:30pm), so stop by and say hi and take a tour. Jon is brewing up some great beer. Doug at the taps (and yes, Brewmaster Jon is a little bit out there). 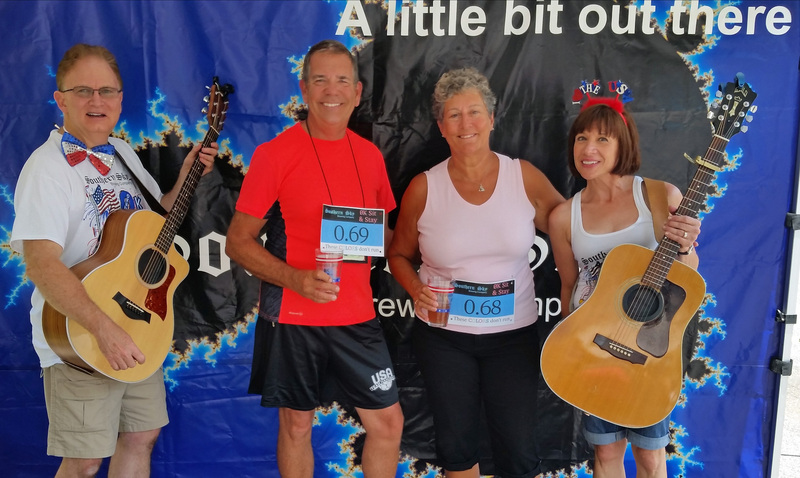 For the fabulous 4th of July weekend, we joined good friends Dan, Terri, Tara and Jon, Melissa and Southern Sky family for the 1st annual Sit & Stay race. It was a grueling 10-second event, sitting in place in the very hot parking lot, beer in hand after a session of stretching and preparations. 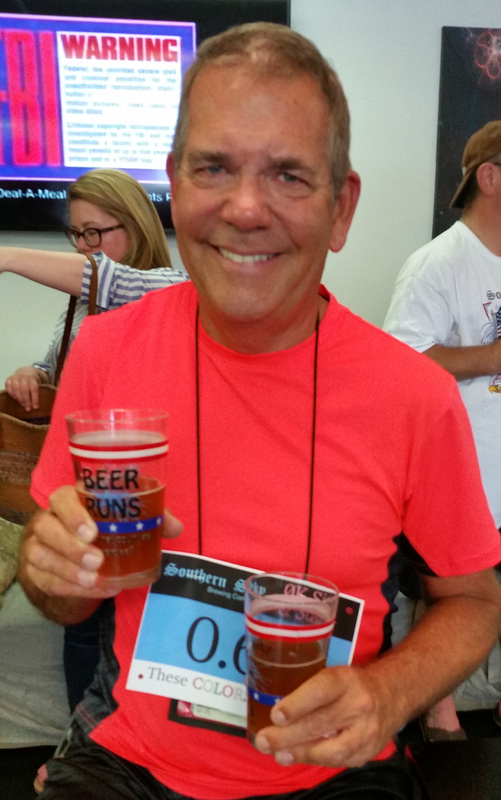 The after-race celebration inside the tasting room included a very refreshing Red, White & Brew white ale with raspberries and blueberries along with their other signature brews. Music by Blind Fate and just a whole afternoon of fun. Dinner at local favorite The Nest afterward for great pulled pork barbecue… it was an exhausting day. 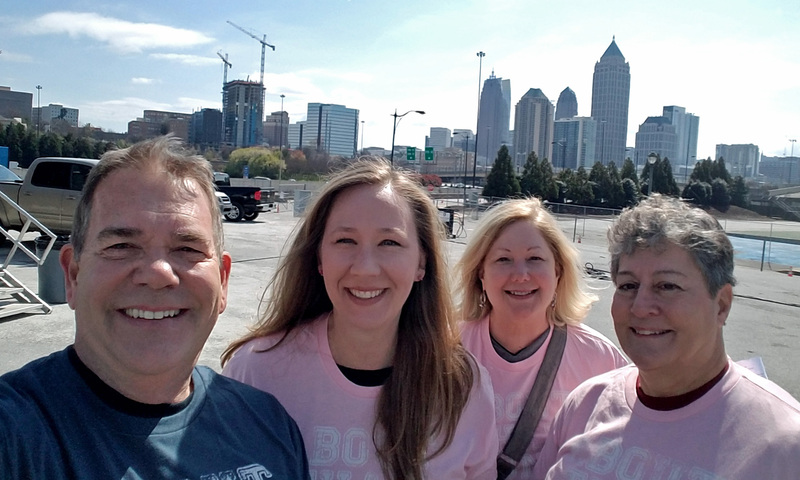 Unfortunately, not a qualifier for the Peachtree Road Race. What a happy gang, celebrating the end of a school year! We kicked off the Memorial Day weekend with a tour and samplings at our local favorite craft brewery. 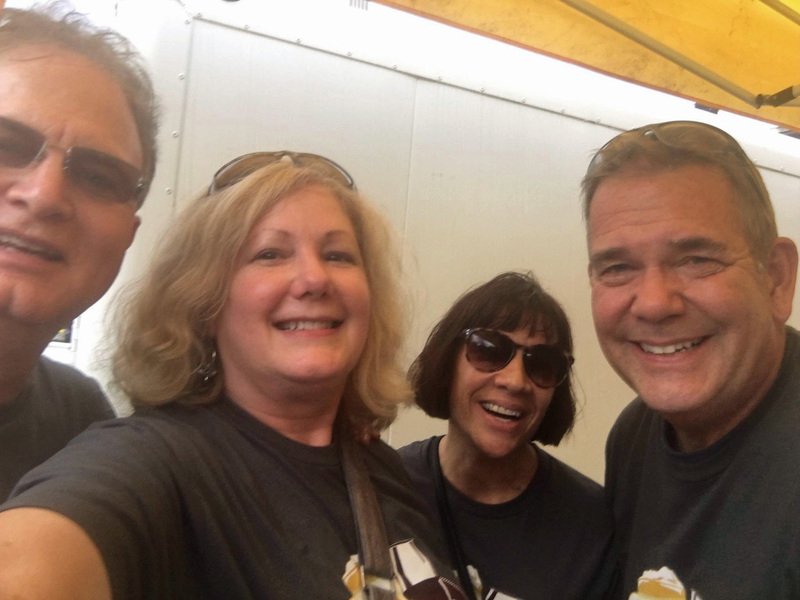 Newly retired Terry (part of the acoustic guitar group Blind Fate), Barb, Jackie and Tara were joined at the bar by brewmaster Jon and assistant brewmaster Jay. A toast to my youngest son, an SPSU Alumnus (before the KSU takeover)! We have peeps! 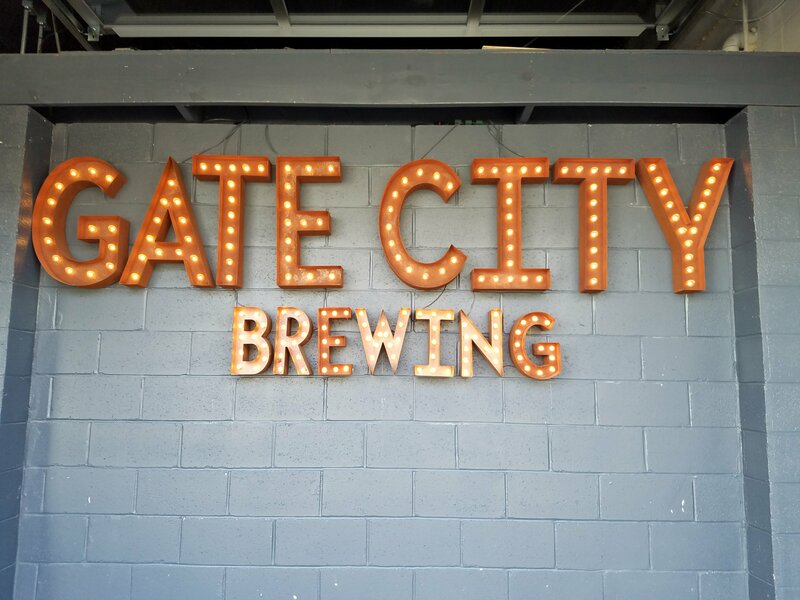 A new Kennesaw brewery has opened and we love their beer and company. St. Patrick’s was a fun night to tour the brewery and try a few of their new brews. Southern Sky Brewery is the new place to be! Oh, and I just had to sport my best green t-shirt (by now it is vintage, since the KSU takeover). Had a great time in San Juan, Grand Turk, St. Thomas, St. John … well, you can check it out in our Places page. It was a hot day in San Juan, though, and a stop at a local brewery helped cool things down. 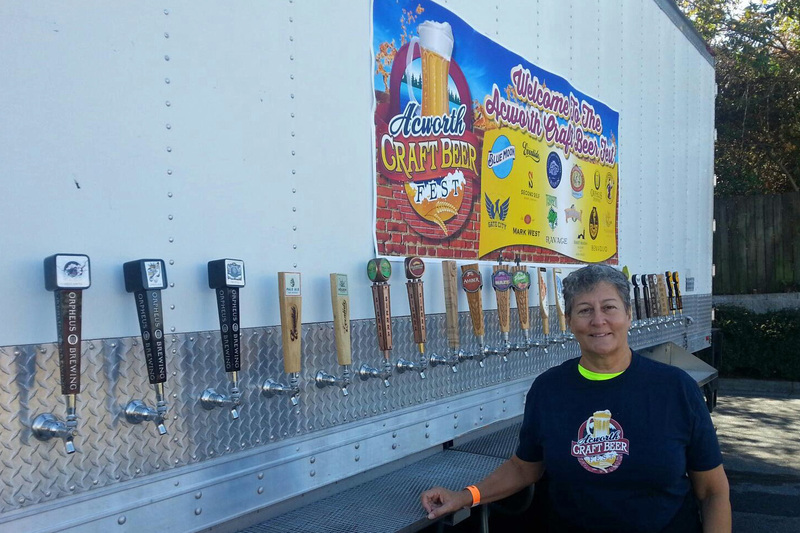 We just HAD to put our new craft beer tasting skills to the test at this local event. 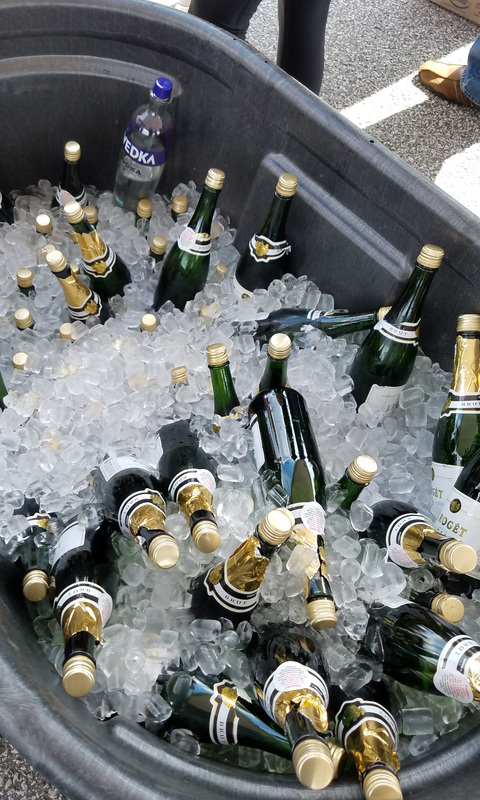 It was only a 4 hour event, but there was plenty of generous sampling and great weather. Kinda need a bit more than a pretzel necklace to munch on though — next time we need to hit the food vendors. Oh, and can you believe we met some former students? 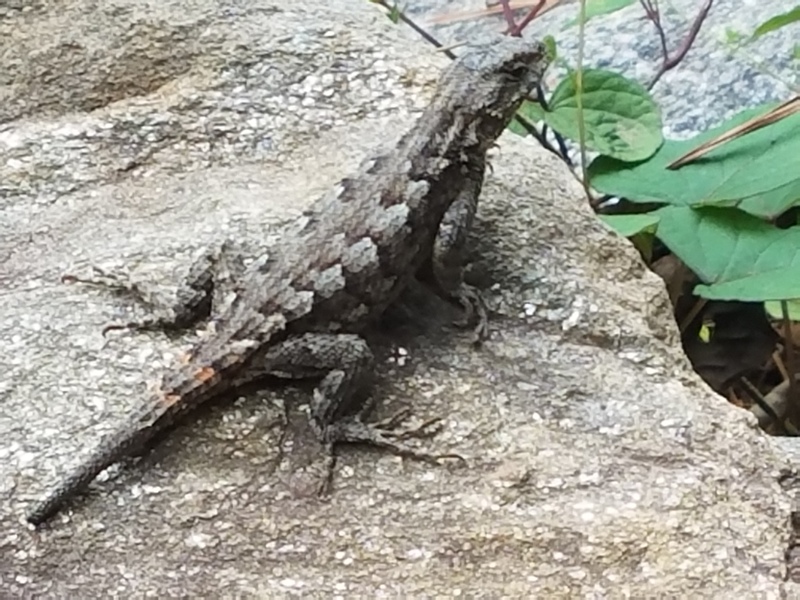 Just a few of the “critters” that call our backyard home.